You must be wondering what AED stands for. AED is automated external defibrillator which is a device used for giving first aid to heart patients. In simple words, it is a device that lets you monitor the heart rate of a patient and if necessary give electric shocks to the patient’s heart to stabilize it. Even though the device sounds technical, it is designed simply so even a layman can use it. AED training and certification is available during first aid workshops, first responder and basic life support and CPR training programs. An AED can be used is life threatening situations where the patient’s heart is working, but its heart rate pattern is fatal. Learning to use an AED is highly intuitive and astonishingly simple. Many people have reported that it is far easier than learning CPR. Current AED courses usually last about three to four hours, include hands-on practice and help increase user competence and confidence. 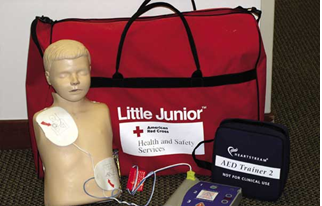 An AED can be used to shock a patient’s heart back into a normal beating pattern. It is important to bear in mind that an AED only complements manual CPR in life threatening situations. Establish that the patient is unresponsive or unconscious. You can try talking to the patient, moving things in front of his eyes to check whether his pupils follow, or even gently tap the patient’s face to see if he or she responds. Call 9-1-1 or the local emergency number (if applicable) and retrieve the AED. Even if you have an AED with you, it’s important to notify EMS. Open the airway and check for breathing. If there is no breathing or breathing appears abnormal, give two slow breaths. When the heart stops, even though there is no circulation, the victim may continue ineffective breathing motions. Ensure that the windpipe is straight and that there are no obstacles blocking the nostrils or the mouth. Also, there should be no pressure on the throat to allow for easy breathing. Check for a pulse. If there is no pulse, turn on the AED. A second rescuer should continue CPR until the AED is attached. If there is no pulse, turn on the AED power. Press the “on” button or open the lid, depending on the device. If a second rescuer is available, he or she should continue CPR until the AED is attached. Attach the AED electrode pads. Bare the victim’s chest and make sure it is dry. Remove the adhesive AED electrode pads from the package and attach them firmly to the chest, as illustrated on the package. It is very important to place pads correctly so that the electric current passes through the heart. One pad should be placed on the victim’s upper right chest, the other on the lower left chest. Thick chest hair should be removed prior to pad placement to ensure adequate contact. Analyze the heart rhythm. Make sure no one is touching the victim. 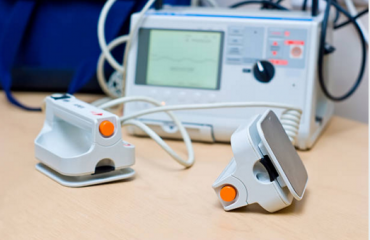 Some AEDs analyze the heart rhythm automatically. Other models prompt you to press the analyze button. Follow the AED’s prompt and call out, “Analyzing rhythm, stand clear!” or “I’m clear, you’re clear, we’re all clear!” or words to this effect. Make sure no one is touching the victim when the AED is analyzing. If the AED indicates “shock advised” go to step 7. If the AED indicates that the victim does not need to be shocked, check his or her pulse again. If there is no pulse, do CPR (ventilation and chest compression) for one minute, instruct onlookers to stand clear, and analyze again. Repeat this sequence of CPR and analysis every minute until help arrives. Press the “shock” button, if advised. Make sure no one is touching the victim. If the AED determines that the victim does need to be shocked, it will prompt you to press the shock button. To ensure the safety of onlookers, make sure no one is touching the victim. Call out, “Shock indicated. Stand clear!” Or, say, “I’m clear, you’re clear, we’re all clear,” or words to this effect. Then, press the shock button. Sometimes, the victim will be revived after just one shock. After the first shock is delivered, immediately analyze again. If the AED advises that another shock is needed, press the shock button a second time. After the second shock is delivered, immediately analyze again. If the AED advises that another shock is needed, press the shock button a third time. After three shocks, if the victim still has no pulse, do CPR (ventilation and chest compression) for one minute. Then, if there still is no pulse, give additional sets of three quick shocks, interspersed with one minute of CPR, until the AED prompts that no shock is indicated. Note: The AED will deliver appropriate energy levels for each shock. Continue cycles of one minute of CPR followed by heart rhythm analysis and appropriate shocks until advanced help arrives. The most important thing to remember when using an AED is to confirm that the victim is unresponsive, not breathing normally and pulseless. For all such victims in confirmed cardiac arrest, turn on the power, analyze, and the AED will coach you through the rest of the steps with visual and/or audio prompts. There is no need to be anxious. Even if you get flustered, as people often do in emergencies, the AED will be your guide.